The Alps, the birthplace of alpine sports offer the most diversified and technical ski terrain in the world. From perfect groomers to some of the most technical off-piste – it’s all here. Modern resorts offer hundreds of kilometers of ski runs, rich nightlife and incredible freeriding experience. So if YOU’re psyched about shredding the park or going on a sick heli trip – call LUEX! In the heart of Europe, the birthplace of skiing, the Alps are the ultimate winter destination. Known as the cradle of alpinism, the Alps are where skiing was born, perfected and celebrated. From world-class, state-of-the-art ski resorts, to timeless alpine villages alive with classic, rustic, charm, skiing in the Alps is unmatched. Although you’ll find some of the best ski resorts in the world scattered across the Alps, a ski holiday in the Alps is about much more than the sport as you’ll find each evening in the legendary villages where the night life is as exciting as the skiing. The Alps mountain ranges slice through Europe from the Mediterranean coast of France to Switzerland, crossing into northern Italy, and up into Austria. This massive mountain range boasts some of the tallest, steepest, most majestic mountains in the world, from the jagged peaks of the Dolomites, to towering Mont Blanc. The Alps represent the epitome of high alpine skiing, where the land is dotted with soaring peaks, dropping down into valleys where mountain villages, from the most sophisticated ski destinations, to timeless, rustic resorts await. On ski trip in the Alps, you can climb onto a lift or cable car and be carried from one peak to the next, from one world-class resort to another, in a single trip. Although the mountains span several countries in Europe, you’ll find that the style of skiing, and the way of life is different everywhere you go. Switzerland is the epitome of the alpine with cable cars whisking skiers and snowboarders from peak to peak, connecting one quaint, cute alpine village to the next, like the entire country is a fine-tuned skiing machine that offers the ultimate in service, but sacrifices none of the classic alpine charm. France is known for more high altitude skiing than elsewhere like on the slopes Mont Blanc, the highest peak in the Alps. Because the ski resorts in France are so well connected and convenient to travel to from other parts of Europe by plane, you’ll find that it is one of the more expensive destinations in the Alps. Italy, on the southern side of the Alps, is known for some of the best weather, where you can ski all day in the sun and sit out on the terrace to enjoy a meal in the middle of winter. Skiing in Italy is fusion of the different countries surrounding it, but one thing Italy is known for is being relatively cheaper and less crowded than its neighboring countries. Like all travels to Italy, the fine cuisine is almost as important as the destinations you visit. Austria pioneered alpine skiing and today its home to world class skiing and snowboarding terrain, only rivaled by the vibrant Austrian villages and après ski scene. The term après might be French in origin, but the Austrians have perfected the après ski party. There are hundreds of ski resorts in the Alps, including many of the world’s most famous. One of our favorite resorts in the Alps is Chamonix at the foot of Mont Blanc in France, a legendary ski resort, famous for extreme off-piste terrain. Verbier, in the Swiss Valais, is one of the largest resorts in the Swiss Alps known for challenging off-piste terrain, but Verbier has something for everyone, and a lively après scene to match. 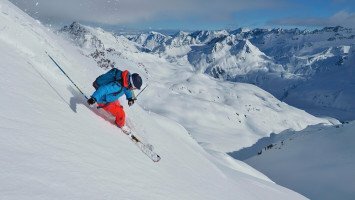 St Anton, in Austria, is a top choice for intermediate and advanced skiers, with almost equal amounts of groomed runs and off-piste slopes and a legendary après-ski scene as fun and adventurous as the skiing itself. Lech, in Austria, is known for having lots of easy runs for beginners and top not ski schools too. 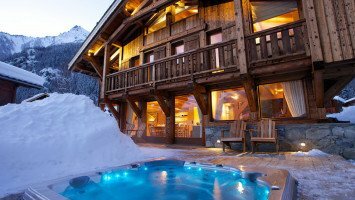 In France, Courchevel is a fun upscale ski resort in the heart of the Les Trois Vallées. LUEX offers every trip type, for every type of skier or snowboarder in the Alps. Freeriders and freestylers will have many choices in every country in the Alps from the legendary off-piste terrain, to some of the world’s most advanced terrain parks for freeriders. 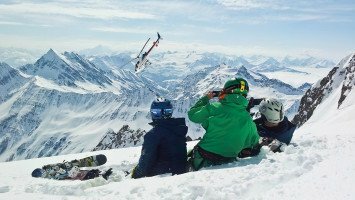 You don’t have to travel around the world for a taste of the thrilling sport of heliskiing because in the Alps you’ll find a great selection of heliski trips. 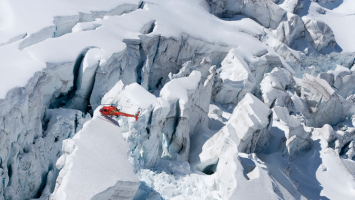 Although heliskiing is highly regulated in Europe, and banned in several countries, in Switzerland and Italy we offer heliski trips based out of several resorts including Zermatt, Verbier and Monterosa. 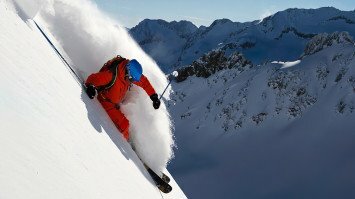 Heliskiing in the Alps is a great way to spend a day exploring the untouched backcountry, but then return to join your group or family, because most trips are based out of ski resorts. Whether you’re traveling with a group of friends, a family with kids, or if you’re skiing solo in search of extreme terrain, we have a trip for you in the Alps. 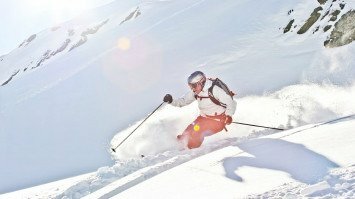 Ski trips in the Alps are suitable for every type of skier or snowboarder including groups, families, honeymooners, steep and deep riders and ski bums. If you like to party, Party People won’t be disappointed with the epic after parties in the Alps. In the heart of the ski world, you’ll find every type of terrain, every style of trip and everything you need for the ski trip of a lifetime. Whatever you’re looking for, you’ll find it in the place where skiing was born, in the Alps!